I have 13 "girls" in my urban backyard. 6 of the newest are just learning to roost. Too cute. Some day I hope to have chickens wandering my backyard. Until then, this would be a start! We have 127 Barred Rocks coming in 10 days and I'm beginning to get really excited. We don't have a clock right now... so if the computer goes off, we're timeless. :-D Love the clock. I breed Buckeyes & have a good size flock, but also keep for fun a few Game (rooster and 3 hens), a pair of Dominiques, a Buff Orpington hen, 14 Guineas, 4 Toulouse geese and a pair of Bourbon Red turkeys. Raising poultry is a hobby for me -- I explain it to others (who want to be bewildered) like, " you play golf, tennis . . . hunt . . . ride 4 wheelers, camp . . . all involving expense, time; well, I enjoy raising poultry." Plus, my chickens give me fresh eggs. 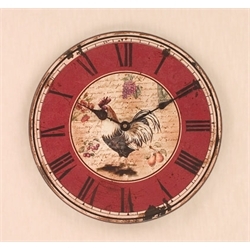 That is a great clock, it would look awesome in my kitchen!